Students and faculty/staff are invited to participate in these hands-on seminars offered March 13-April 4 by the Media Development Center. No enrollment is needed. Stop by 213 Hale Library at the times and dates below. For details, see the MDC classes webpage or contact Jahvelle Rhone, media development coordinator (785-532-7422, rhone@k-state.edu). The Media Development Center (213 Hale Library) will have reduced hours during K-State spring break 2014. March 17-21 (Mon-Fri) — noon-4 p.m. The Media Development Center (MDC) in 213 Hale Library re-opens Tuesday, May 28, with its regular summer schedule. See the website at k-state.edu/its/mdc for details. Saturday noon – 4 p.m. The IT Help Desk has reduced hours during spring break. The schedule for March 18-24 is shown below. Monday, March 18 8 a.m. – 10 p.m. 8 a.m. – 6 p.m.
Tuesday, March 19 8 a.m. – 10 p.m. 8 a.m. – 6 p.m.
Wednesday, March 20 8 a.m. – 10 p.m. 8 a.m. – 6 p.m.
Thursday, March 21 8 a.m. – 10 p.m. 8 a.m. – 6 p.m.
Friday, March 22 8 a.m. – 10 p.m. 8 a.m. – 6 p.m.
Saturday, March 23 10 a.m. – 5 p.m. 1 p.m. – 5 p.m.
Sunday, March 24 1 p.m. – midnight 1 p.m. – 10 p.m. The Media Development Center (213 Hale Library) has extended hours Sunday, April 22, through Thursday, May 10, to better serve K-Staters who need more time to complete semester projects. April 27 (Fri) — 10 a.m.-5 p.m.
April 28 (Sat) — noon-5 p.m.
May 4 (Fri) — 10 a.m.-5 p.m.
May 5 (Sat) — noon-5 p.m.
May 7-10 (Mon-Thu) — 10 a.m.-10 p.m.
May 11 (Fri) — 10 a.m.-5 p.m. 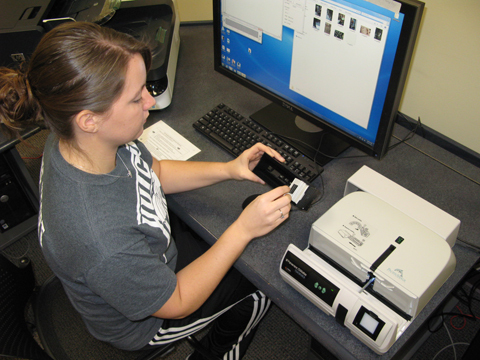 The Media Development Center in 213 Hale Library has recently added an automated 35mm slide scanner. The Pacific Image PowerSlide 3650 is designed to convert large numbers of 35mm mounted slides into digital files that can be searched, processed, printed, or delivered electronically. Scanning 50 mounted slides takes approximately 50 minutes, or 1 side per minute. The impresssive optical resolution of 5000 dpi produces digital files that remain true to the original images. Equipment in the Media Development Center is available for use by all K-State faculty/staff and students. For more information, contact Phyllis Epps, MDC manager, at 785-532-4921. The Media Development Center, 213 Hale Library, will begin extended hours from Monday, Nov. 28, through Friday, Dec. 9, to provide extra time for K-Staters’ end-of-semester project needs. The MDC has a variety of multimedia equipment available for free use by K-Staters. The full schedule prior to Thanksgiving and final exams is on the MDC homepage. Regular hours resume Saturday, Dec. 10, just before finals week. The Media Development Center has recently added an oversize scanner to the lab. 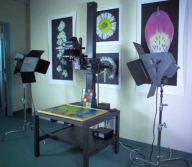 The copy stand mount can accommodate artwork measuring up to 36 inches by 48 inches. Larger works measuring up to 5 feet by 7 feet can be mounted to the wall and digitized. The Media Development Center (213 Hale Library) has extended hours during the weeks up to and including finals week. Friday, April 29, and Friday, May 6 — 10 a.m.-5 p.m.
Saturday, April 30, and Saturday, May 7 — noon-5 p.m.
Sunday, May 1, and Sunday, May 8 — 1-10 p.m.
Saturday, March 19 — 1-5 p.m.
Sunday, March 20 — 1-5 p.m.
Monday-Friday, March 21-25 — noon-5 p.m.
Saturday, March 26 — 1-5 p.m.